Photo courtesy of the Anti-Defamation League. Long Beach is the birthplace of the nation’s first hybrid street-prison gang Public Enemy No. 1 (PEN1 or PENI), which is also one of the nation’s most violent white supremacist gangs. The discussion around racism has been both local and national. I have previously spoken about the danger of the normalization of white supremacist symbology as well as the Long Beach community staunchly standing by its Muslim-American neighbors when President Trump proposed a registry for Muslim-Americans, actions that many felt contributed toward normalizing racist ideology and rhetoric. Caught in this ideological crossfire, A&E announced and eventually cancelled a “Generation KKK” reality series. A&E is no stranger to white supremacist gangs, including PEN1. The network covered the gang in a documentary series called “Gangland” in 2010 and prompted lawsuits over its allegedly unethical revealing of sources and former members. That’s why I have kept the quotes in this article anonymous. Other past members or affiliates who have spoken of PEN1 on the record have resulted in dangerous if not outright lifetaking situations. One of its most profiled cases was that of Scott Miller, a founding member of PEN1 who was executed in the back of the head with a 9mm handgun by Michael Allen Lamb and Jacob Anthony Rump on March 8, 2002, after he gave a Los Angeles Fox News affiliate an on-camera interview. Miller, like many during the initial forming of PEN1, wasn’t necessarily filled with hate but he was, at least initially, a punk. In fact, the name of the group comes from the 1980’s British punk band Rudimentary Peni (with no formal connection). The American punk scene—which originated on the East Coast in anti-authoritative group that espoused a deep intolerance toward hatred—became snarled in violence when it arrived in Los Angeles, particularly between 1983 and 1986. Authors Heath Mattioli and David Spacone noted in their already seminal Disco’s Out, Murder’s In!, an account of Frank the Shank’s rise to power via the La Mirada Punks (LMP), that the punk scene in LA became a term synonymous with violence. can you belive [sic] that LMP has been running La Mirada since 1977, we have been around since punk-rock began. new york influenced it, england started it, Los Angeles made it hard-core and the LMP made history of it ! From Frank to “VICE”—which noted in its own interview with Mattioli and Spacone that guys from “the 80s DC scene got beat up a lot, but then they came to L.A. and saw an even more aggressive scene”—to one of our own sources, each have noted that L.A. marked the geographic point where violence took over punk. The result was a convoluted mess of identities, missions, and philosophies. 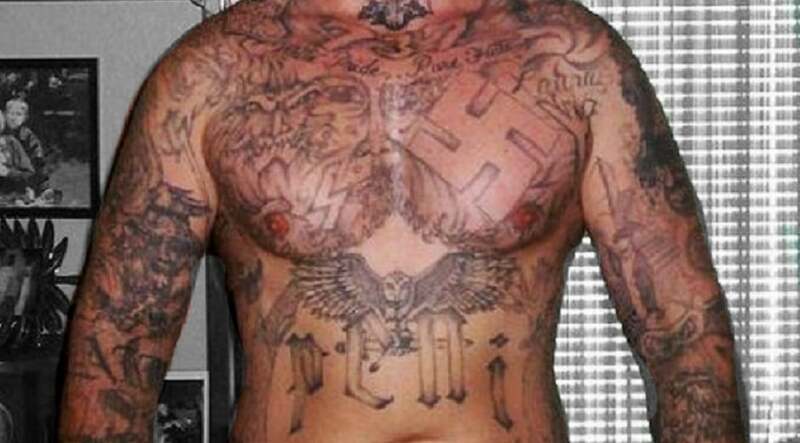 Following the murder by Miller, some of the S.S. LADS joined PEN1 or the far more powerful Aryan Brotherhood, while the Latinos separated into full-on barrio gangs and furthering the racial divide. This made Long Beach—in between Hollywood and OC—one of the hotbeds for gang violence. It earned the club the name Fender’s Brawlroom. This made sense: Fender’s operated during the peak of violence in the punk scene, from 1984 to 1989, and with acts ranging from Black Flag to the Descendents, GWAR to The Adolescents, Bad Religion to Sublime. To top it off, methamphetamine—”snort’n’smoke mounds of it before and during shows,” according to one former LADS member—along with ringers and slammers (the name given to those who shot cocaine) and smoking sherms (cigarettes dipped in PCP) only added to the insanity and lack of clarity in an already hostile situation. PEN1 thus simultaneously gained power but lost it: as the artists of the punk scene—from Henry Rollins, who denounced it from the get-go to Jack Grisham of T.S.O.L., who admitted he contributed to it—began to see it as a tangible detriment, PEN1 had to move operations. As it slowly left its Long Beach roots and headed south into Orange County during the 90s, it became more notorious, more violent, led by its obsession with speed trafficking, prostitution, and identity theft as they recruited “latchkey kids”—bored, upper-middle class white kids. In short: after the Aryan Brotherhood was state-designated a prison gang—and thus dwindling its power through harsher sentencing that equally dwindled operations like drug sales—the Low Riders acted as foot soldiers for the Aryan Brotherhood, helping connect it to the drug world and beyond. The result? A rise in clout for PEN1. This was cemented by Donald Reed “Popeye” Mazza, one of the leaders of PEN1 and the founder of the PEN1 Death Squad (PDS) as well as one of its three members given SHU sentences; Nick “Droopy” Rizzo and Devlin “Gazoo” Stringfellow joined Mazza due to their connections to the Aryan Brotherhood and Low Riders. Mazza’s creation of the PDS was a major turn in PEN1’s history: to be a member, one had to murder an enemy. Mazza is serving time in one of California’s most notorious maximum security prisons, Pelican Bay. The state’s Pelican Bay prison lies just 11 miles from the Oregon border in 275 acres of remote countryside and forest. Having opened in 1989 at a cost of some $220 million, it was home to over 3,400 inmates in 2007, significantly more than it was intended to house; it now holds roughly 2,200 inmates. Mazza eventually earned his “dancing shoes” with the Aryan Brotherhood in the the summer of 2005 at Pelican, meaning he was an official member of the Brotherhood and further adding to the clout of PEN1 on both the inside and out. Between 2004 and 2007, PEN1’s ranks doubled to an estimated 400 members. This surge in clout and membership brought about two major blows to PEN1’s operations from law enforcement agencies that decade, specifically 2006 and 2010. A 10-month-long investigation in 2006 into PEN1 led by the Anaheim Police Department resulted in the arrest of 67 alleged members of the gang across 75 locations. With 300 officers from more than two dozen federal and local law enforcement agencies, the operation was sparked by the discovery of a hit list held by PEN1 leaders that eyed an Orange County prosecutor and five police officers in different departments. Orange County would launch its biggest assault on PEN1 in 2010, dubbed “Operation Stormfront” after the large white supremacy message board of the same name. Led by the arrest of 34 alleged members, county, state, and federal investigations resulted in three related state indictments that named 14 defendants on charges including extortion, conspiracy and solicitation of aggravated assault and murder. This, however, has not deterred PEN1’s propensity to violence. The work of OC Weekly—particularly that of journalist R. Scott Moxley—has documented this most heavily, showing that outright pettiness, psychopathy and murder, drug abuse and sociopathy, snitching being rewarded by law enforcement, lawsuits over identity, and other nightmares are the name of the PEN1 game. Most recently, Craig Tanber—just months after being released from prison in June 13, 2015 after agreeing to a plea deal in 2007 that landed him six years in prison for voluntary manslaughter—allegedly stabbed 22-year-old Shayan Mazroei in the upper torso multiple times outside a bar in Laguna Niguel on Sept. 8 of that year. The case divided a community, with family members urging to charge the crime as a hate crime and prosecutors saying they lacked evidence that the crime was racially motivated. Earlier this year, one of PEN1’s most disturbing violators of human decency, Billy Joe Johnson, was sentenced to death. He was not only involved in the murder to Miller but two other murders, Clyde Nordeen (killed with pick ax) and Cory Lamons (killed with a claw hammer and the murder with which Tanber was connected with). The latter murder was intended to simply be a “torturing,” with Johnson trying to extract information about the location of allegedly stolen money. Using a claw hammer as a tool to smack Lamons upside the head, Johnson didn’t realize that the trauma he was causing with his hits were life threatening. PEN1 now mainly operates out of Orange County.